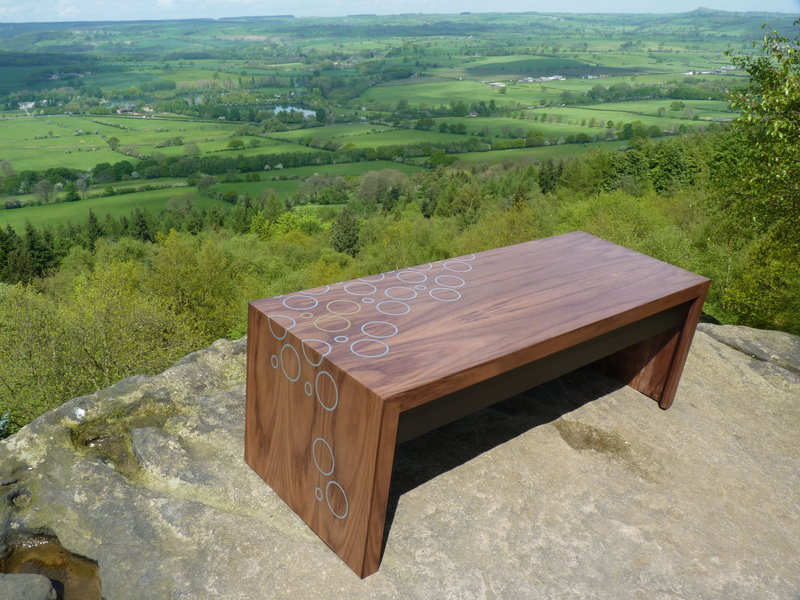 Inspired by the ‘Tour de France’ starting in Yorkshire in July we have produced a limited edition, hand-crafted table to signify the Peloton or Yellow Jersey rider leading the pack through the beautiful hills of the Wharfe Valley, the opening backdrop of the prestigious race. ‘Le Poursuivant’, or ‘the chaser’ is crafted from a single piece of Walnut veneer which is then carefully wrapped over the full length of the table in a continuous ‘waterfall’ grain pattern, using resin set elliptical inlays of powdered metal to signify the abstract form and flow of the Peloton. Photos taken on top of the Chevin Forest Park with panoramic views across the Wharfe Valley. The ‘Stage One’ route passes through Otley below before heading into North Yorkshire and a sprint finish in the spa town of Harrogate on the 5 July 2014.